Cambodia’s a very flat country inland. There are mountains along the border with Thailand, Laos and Vietnam – well, hills really but I’m not going to quibble – and even more along the southwest coastline, but inland all you’ll see is great expanses of flatness broken only by the stubble of sugar palms in the distance that look like someone forgot to shave them and the odd bump in the landscape, as peculiarly pert and inappropriate as a teenager’s pimple. It can get you down after a while that flatness, in ways I am still not sure how to describe. Changes in perspective help to shift us out of our ruts and reverie; they’re always interesting and useful, essential even, for developing our growth in understanding. Which is why I’m such a fan of rooftop bars. Getting up off street level gives you a whole new view of town, and it’s extraordinary how, from some rooftops, Siem Reap looks so incredibly green. During rainy season too, watching the storms come in can be spectacular. 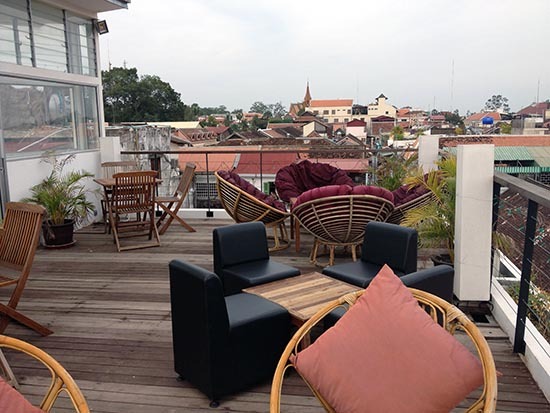 Rooftop bars are also great spots for picking up a breeze, along with your Sea Breeze, and cooling down a little. One of the newest in town is Purple Mangosteen on Alley West, a freshly renovated guesthouse whose gorgeousness is matched perfectly by the warmth and charm of the owner. 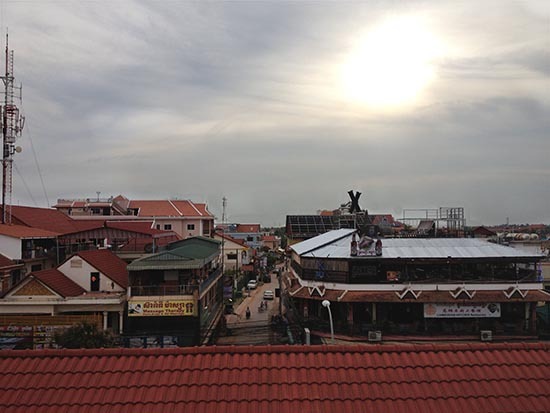 Being in the centre of town, the small roof at the top of four winding flights of stairs is a fabulous location for taking in Siem Reap’s undulating roofs, and getting a better perspective on the town. Looking at the rooftiles of the buildings will often give you an idea of their age, with the French colonial buildings having a darker tinge. From there, you can espy some of the other rooftops too. Terrasse des Elephants has a lovely rooftop with a pool that is open to small numbers of outside visitors, provided you order from the bar. As with all hotels that are generous enough to allow non-guests, priority will always go to guests in case there is crowding. Here, you may become so comfortable in the poolside loungers however, that you completely forget to check out any views at all, and to that I say, what harm? For a different vibe altogether, X-Bar is technically a rooftop bar, though usually one frequented when it’s so late that the only view appreciated is the sight of another beer being poured. They’ve got numerous pool tables and host open-mic nights here on Wednesdays, alongside being one of the main gig venues in town. If you’re looking for music, this is one of the places to check out. On a more sedate level, Soria Moria on Wat Bo Road has a small rooftop bar that, in my view, tops them all. It’s simple, has 360 degree views, is stylish without being overly so, and has a hot-tub. Soria Moria hosts events here regularly, including film nights on Mondays, Ladies’ Night on Tuesdays and many more. See their website for more information. Further up Wat Bo Road is Claremont Angkor Hotel. Their much larger rooftop bar has kind of a cool futuristic-retro feel to it (I’m not making that up), and looks like a great spot for winding down the day with a few perky cocktails. If you’re on a budget, or looking for a more relaxed vibe, head down to the Garden Village Guesthouse. With US$0.50 beer, a huge music selection that you’re free to pick and choose from, pool tables, a relaxed, open and lively atmosphere, this can be a great spot to chill out in anticipation of the day’s last glow. Head up to the very top of the building for views that go all the way down to Phnom Krom to the east.